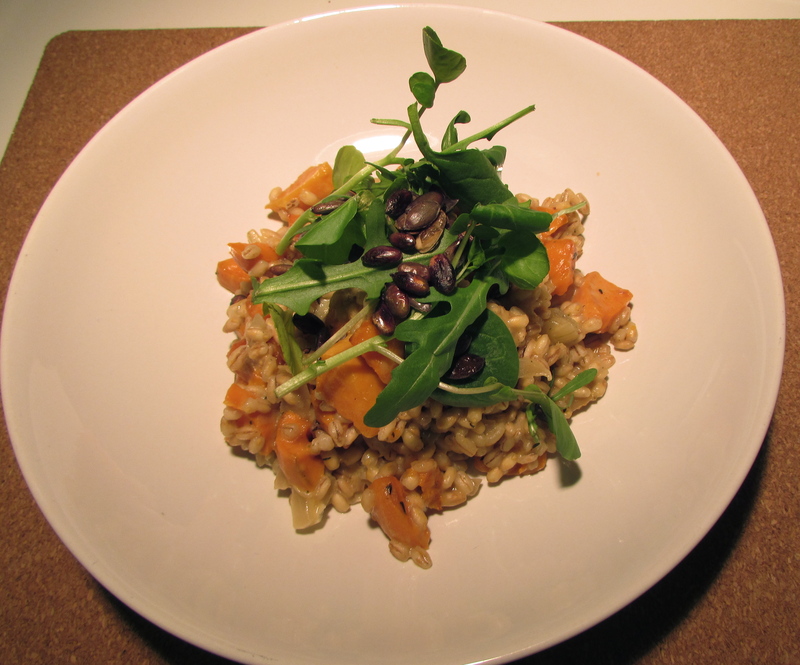 I conjured up this tasty rice dish with ingredients in the fridge and cupboard. It’s tasty and simple to make. 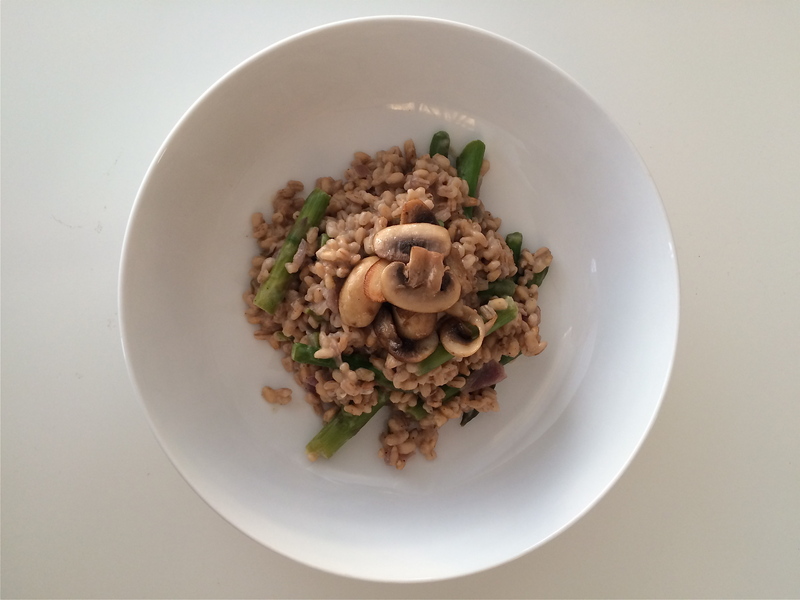 Pearl barley is a healthy wholegrain and is a great substitute for risotto rice. It brings earthy, nutty flavours and adds wonderful texture with a bit of bite. The vibrant, green asparagus has a satisfying crunch with a striking and fresh flavour. The creme fraiche and cheese add a layer of richness, but these ingredients can be left out to make the dish vegan friendly. And the soft cooked mushrooms on top balance out the crunchy textures. This dish is cooked using the same method as risotto. It’s a great meal to make one evening after work. Pour the oil into a large frying pan and put on a medium heat. Add the onion and fry for 5 minutes, or until it has softened. Pour in the pearl barley and mix in well with the onion. Cook for a further 5 minutes. Meanwhile, cut off the woody ends of the asparagus spears and chop each spear into thirds. Turn the pan down to a low heat and add a ladleful of stock to the pan, stirring occasionally. When the stock has been absorbed by the barley, add another ladleful and repeat the process. Put the chopped asparagus into the pan and stir in with the mixture. Add the next ladleful of stock as before, and continue this process until all of the stock has been added. This should take about 30 minutes. While the risotto is cooking, add the butter to a small pan and put it on a medium heat. Chop the mushrooms into thin slices and add them to the pan. Cook for 7-10 minutes, until the mushrooms start to brown. Set aside. When all of the stock has been absorbed by the barley, give a grain or two a taste. It should be fairly softer, but with a bit of bite. If it’s not quite ready, add a splash of water and wait for that to absorb, for a further 5 minutes or so. When the barley is ready, take the pan off the heat and season well. Mix in the creme fraiche and cheese and serve in large bowls with the mushrooms arranged on top. Pearl barley is a great grain. It’s cheap, easy to cook and filling. It has a unique, nutty taste and a light and bouncy texture. I like to think of it as quinoa’s less pretentious sibling. As the days are getting slightly milder, I’m starting to steer away from hearty, wintry foods, and thinking about lighter, more wholesome ingredients. To celebrate Meat Free Week, I’ve put together a simple and tasty vegetarian pearl barley risotto with a variety of delicious tastes and textures. The flavour of the soft, roasted sweet potato is complimented by the pungent thyme, alongside rich and creamy goat’s cheese, all mixed in with the pearl barley. A topping of crisp, green salad leaves adds a fresh, peppery element and the smoky, toasted pumpkin seeds finish the dish off with a satisfying crunch. Great as a lunchtime or evening meal. Put the oven on to gas mark 6. Pour 1 tbsp of oil into a medium-sized baking dish and place in the oven to heat up. Place a large frying pan or wok on a medium heat and pour in 1 tbsp of oil. Add the onions to the pan and fry for five minutes or until soft, stirring frequently. After a couple of minutes, take the baking dish out of the oven and add the sweet potato, coating all of the pieces in the oil using a fish slice or large spoon. Scatter the thyme across the dish and turn the sweet potato pieces over in the oil again, to make sure they’re fully coated. Place in the oven for 25 minutes, checking them half way through. Turn the pieces over to make sure they are cooked throughout. Meanwhile, add the knob of butter to the frying pan and move it around the pan with a wooden spoon until it melts. Pour the pearl barley into the pan and stir in with the onions. Cook for five minutes. Lower the heat slightly. Gradually add in the stock, a ladleful at a time, stirring in with the barley. Wait until the stock has been absorbed by the barley and then add the next batch. Repeat this until all of the stock has been added; this should take between 20 and 25 minutes, by which time the barley should be cooked. Give it a taste after 20 minutes – it should have a little bit of bite. While the risotto is cooking, put a small saucepan on a medium heat and spray in three squirts of the cooking spray. Add the pumpkin seeds and cook for five minutes, or until they start to brown and make a slight popping sound. Take off the heat and place to one side. There should still be a little bit of liquid left in the pan from the stock; make sure it doesn’t dry out. If it does, add a little bit of water. Then stir in half of the goat’s cheese until it melts in with the liquid. Season well. Take the sweet potato out of the oven and add to the pan, stirring well so the pieces are evenly distributed among the barley. Serve in large pasta bowls, topped with the salad and seeds, and crumble over the remaining goat’s cheese. If you like this recipe, it would be great to hear from you. Please feel free to leave a comment or a question below.